Welcome back to our invasion! I know you really missed your tours around our home. So by your request, I will allow you back to invade our home! Are you excited?! This time, I will let you see where I place my new PC. Have your camera with you as we enter our home. Take a glance to the area where my new PC was situated. One...two...c'mon...!!! 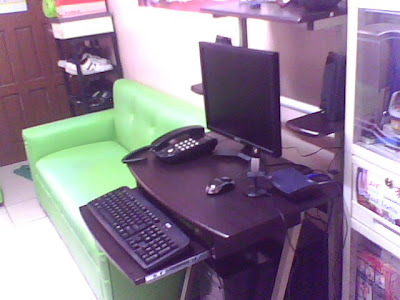 A Study and An Office Area...!!! One week before I had my new desktop, I bought a computer table for it. 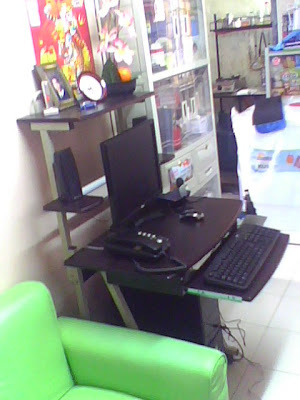 I looked for a sturdy and a multi-function brand in Homeworks, ACE Hardware, and in SM Mall here in our place. After a series of search, I finally found it in the SM mall. Just like what you see, my computer table is a black sturdy wooden type. It has a three layer table. The bottom layer is for the AVR and for the CPU, the second layer is for the monitor where in this layer, it has another two mini-layers on both side for the speaker. It has a sliding drawer on the second layer for the keyboard. 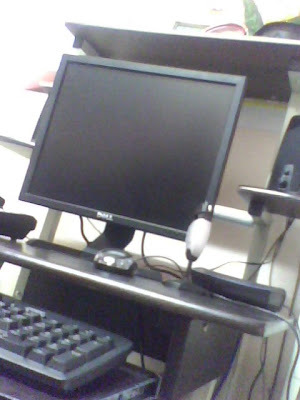 Speakers, optical mouse, web camera, our internet modem, telephone, in addition to the monitor and to the keyboard were situated in the second layer. Well, on the third layer is a space for the printer or scanner. 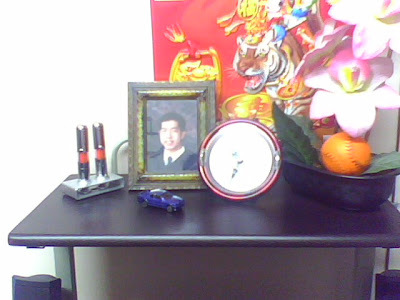 But since I have no printer or scanner, I used this layer for displays of other things just like what you have seen. A Cool and Well-Ventilated Place! Do You Like My Computer Table?! I Just Put Design on The Third Layer Since I Have No Printer or Scanner Yet! 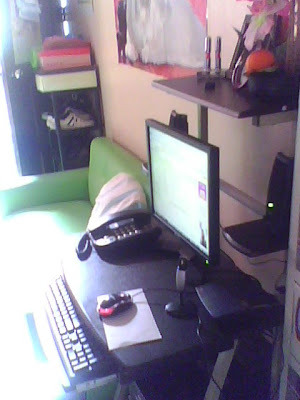 I decided to place my new PC in our sala in between our green sofa and my bookshelf. I first thought to place it in our bedroom, but since the phone was in our sala, we agreed to locate it beside the telephone. In fact since it is beside my bookshelf, I decided to call this area as my office extension or a study area! This area also is really cool and well-ventilated. It is located in-between our main door (with a window beside it) and in our window in our dining area so cool breeze revolves around! You really feel cold in this place! So relaxing! But then even the area was well-ventilated, I still bought a small industrial fan which is only dedicated for my CPU. It was placed in the bottom layer of my computer table directed toward my CPU. I really feel the cool air given by my small industrial fan in my legs! Now what can you say about my location for my new PC? Do you like where I placed it? And how about my designs...?! Are you also satisfied with the computer table I bought to house my new PC? Feel free to give you comments and suggestion...!!! 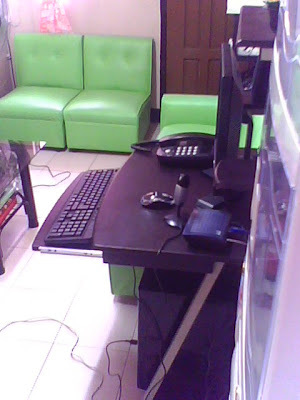 Nice PC workspace for you, especially the DELL LCD. All you need is an ever-reliable printer and scanner. I suggest you buy 3-in-1 printer and scanner. At last, you can now update your blogs in the comfort of your own home. Your creativity and productivity will increase traffic and boost your income.